We spent over 31 hours researching and testing 15 different kinds of microfiber car towels and found that quality of the fabric, type of microfiber towel it is, and cost were most important. The AmazonBasics Microfiber Cleaning Cloth scored high above the other car towels we researched in all categories and is our top pick. We liked that the towels did not leave any streaks or residue behind and that they could be washed in the washing machine and reused. They absorb 8 times their own weight which makes them terrific for many types of cleaning jobs. No special cleansers required, they can be washed with regular detergent. There are many different levels and weaves of microfiber car towels available for car owners to purchase. Due to the different grades, they can be suitable for a variety of jobs. It’s important for you to know a few things before you start hunting for the right microfiber car towel. What jobs will you be doing with the towels? This is a very important thing to know because it will determine the type of microfiber car towel you choose. 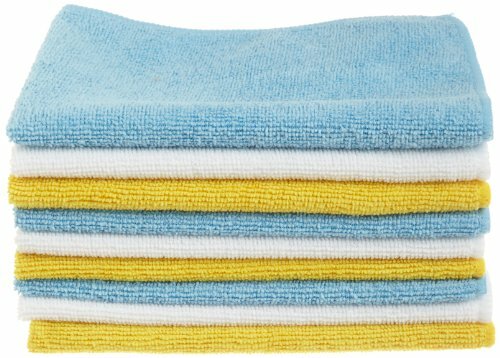 In general, the thick pile microfiber towels are better for removing tough dirt and oils from surfaces. If you’re wiping down counters or wiping off vehicles, the standard woven microfiber towel that is considered medium grade will work well. The very finely woven varieties of microfiber car towels are not only the most expensive; they are the perfect choice for cleaning mirrors to a beautiful shine without any streaks. Whatever you are going to be doing with your car towels, the main thing is to know ahead of time so you can choose the right grade and weave of towel. AmazonBasics brings you a stack of terrific microfiber car clothes that are perfect for cleaning cars, trucks, boats, RVs, Television sets, computers and counter tops too. These microfiber car towels are reusable and fully washable and do not lose their absorbency when they are washed. You can use each towel hundreds of times and it will work just as well the 50th time as the 1st time. You will get the best results from washing these towels in cold water. They are super soft and have no abrasive qualities whatsoever, which makes them perfect for your car’s paint job. Each towel is super absorbent and makes it easy to trap dirt, grime and other particles that can scratch the surface of the paint. 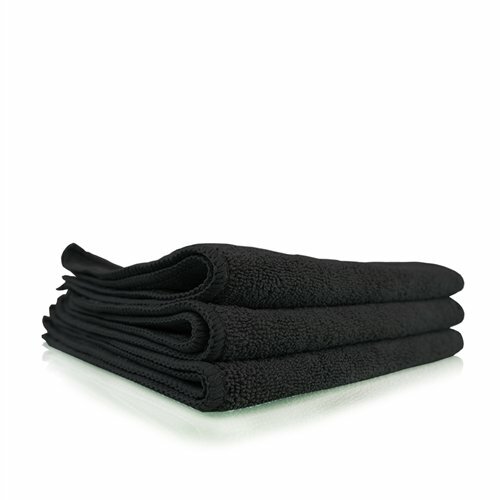 Using these microfiber car towels will not result in leaving behind any residue or streaks. They can literally absorb up to 8 times their own weight! You don’t need to clean these towels with any special cleaners or chemicals, regular washing detergent will work just fine. Rinse them out or wash them after use and they are ready to be used again. They are made from a combination of 90% polyester and 10% Polyamide. They are the perfect microfiber car towel that can be used on more than just the car. If you have a cleaning business, they are perfect for counter tops and mirrors. Each towel measures 12” x 16”. This professional grade microfiber car towel has been created and designed to stand up to literally thousands of washes without changing its cleaning and absorbency capabilities. You can get this towel in 6 different colors to match your home or work décor if you choose. Another benefit to getting several different colors is that you can color coordinate the towel color to the type of job it is for. You can get all one color if you prefer, but sometimes it’s better to have specific towels for specific jobs. You can use the Chemical Guys Black Workhorse microfiber towels for cleaning and dressing, cars, trucks, boats, wheels, tires, engine bays and even the undercarriage of the vehicle. They are made from a blend of 70 polyester/30 polyamide for super soft, scratch free use on metal, plastic, painted surfaces and glass too. Each towel measures 16” x 16” and you get 48 in this pack. They also carry a jumbo size which is 24” x 16” for those extra large jobs. They are the perfect towels to use for all the dirty, grimy, tough jobs you have in the garage. They are truly the workhorses of the microfiber towel world. Every mechanic, hobby or professional, needs to have a set of these tough heavy duty towels. They are 100% lint free, won’t shed or lose any of its fibers and can be washed in the washer with no problems. You get 36 -16” x 16” microfiber car towels in this economical pack from Eurow. The super soft microfibers lift and trap dirt, grime, moisture and other particles leaving you with a clean, dry surface that will positively shine. These environmentally friendly microfiber car towels require no water to work. You also don’t need to use cleaner. When used dry, they don’t streak, leave any traces of lint and they won’t scratch the surfaces you are using them on. You CAN use them dry and will be surprised to hear that they can absorb up to 8 times their own weight in water which makes them great for unexpected spills. These great microfiber car towels attract dust and other particles much like a magnet would. They trap these microscopic particles within the fibers of the towel. Because the fibers are so small, you will remove 99% of bacteria easily and without problem. Each towel can be used hundreds of times and they are machine washable and able to be dried in the dryer on tumble dry low as well with no reduction in performance. They don’t need to be ironed and shouldn’t be. To prevent the lessening of their performance, remember not to use chlorine bleach or fabric softener when washing these towels. You will want to wash them with other items that don’t throw off lint such as regular clothing or bed sheets and not towels. These microfiber car towels are made of 80% polyester and 20% polyamide. They are also great for removing wax dust which makes them a good buffer after a wax job. Every one of these microfiber car towels works great for taking care of cleaning jobs concerning your vehicles, your garage or workshop and your home as well. With their absorbency and re-usability, they are a great way to take care of your different cleaning tasks in an economical way. Below we have provided a buyer’s guide to help you get the information you need to make a decision about which microfiber car towel is the best choice for your needs. These are not your typical “rags” that you can buy in packs in the discount store. They DO come in packs, but you will find these towels to be superior to anything you’ve used before, especially when it comes to dealing with cleaning your vehicles, boats, motorcycles, RVs and other potentially greasy and grimy surfaces and items. Just wash the car towels in cold water, tumble dry, don’t iron them and they are ready for the next batch if cleaning tasks. There are some imposter microfiber car cloths out there that claim to be great but once you get them home, you realize that you are dealing with a less than quality product. Before you take the step to purchase microfiber car towels, the most important thing you need to make sure of is that you are purchasing a high quality product that will give you the performance you are looking for. Make sure that when you are considering a certain type or brand of microfiber car towels that you look at the fiber content. The best quality towels with have a blend of 80% polyester and 20% polyamide. A true 80/20 combination with behave differently than other combinations which can lead to disappointment in the overall product. If you stick to the true 80/20 rule, you will not be disappointed in your purchase. Microfiber towels with piping around the edges prevent the towels from fraying or unraveling and making them useless. You want to try to ensure that that polyester is used for the piping so it is able to be used multiple times without breaking down. Other edging tends to come apart or wear out easily. Compare the common features that most microfiber towels have to see who excels and stands out among the difference choices you have available. Once you compare the different towels you will have a better understanding of which ones will work the best for your needs. The reason that microfiber car towels work so well is because microfiber is charged and literally attracts dirt and dust like a magnet. Another benefit is that it doesn’t leave streaks or lint everywhere so it is a favorite to use on windows and mirrors to obtain a brilliant shine that is flawless. You will find that in the inexpensive microfiber towels, the thread is not split. In the higher quality designs, the threads are split enabling them to absorb up to 8 times their weight in water. On cheaper microfiber towels, the threads are larger as well. There is little to no polyamide in the less expensive microfiber towels. This typically results in towels that are not absorbent at all which does no good when it comes to washing or drying your vehicles. There are many different types of microfiber towels. They are sometimes measured in “pile” height. We’ve listed the common types and the uses they are typically best suited for below. Short pile – 80/20 – 220 GSM Good for general cleaning tasks and for use on non-sensitive areas. The short pile microfiber car towel is great for door jams, car interiors, wheels, exhausts and windows too. Medium Pile – 75/25 – 360 GSM the 75/25 medium pile microfiber towels are safe on any surface you want to use it on. It is a lot softer than the 80/20 short pile and has a plush feel to it. It is the perfect choice for applying and removing wax, removing polish, any kind of rinse less washes, buffing the vehicle and cleaning interiors. This is not recommended for super dirty jobs, as it is a higher quality grade. Medium Plush Pile – 75/25 600 GSM – The medium plush pile is softer and plusher than the medium pile. It has the same specifications that the medium pile has. It is safe for all surfaces but it is recommended that it only be used on delicate surfaces that can scratch easily. Long Pile – 70/30 – 600 GSM – Another microfiber towel that is safe for use on all surfaces. It is truly one of the softest towels you can get and is perfect for buffing and drying to get optimum shine and is great for interiors as well. This is another towel that is not a good choice for dirty jobs. Waffle Weave Pile – 80/20 – GSM 350 – You can use this waffle weave towel on all surfaces and it is a terrific towel for cleaning mirrors and glass. It is extremely absorbent making it a great vehicle drying towel. 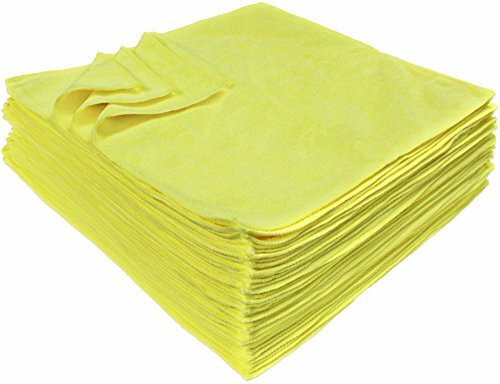 Applicator Pile – 70/30 – GSM 350 – This towel is perfect for applying any kind of wax, sealant, glaze, or dressing and is safe for use on all surfaces. Microfiber car towels are very easy to use. If you’re washing the vehicle all you have to do is wet the towel, wring it out well and wipe the vehicle off. If you’re drying it, you do the same thing except in a little different order: wipe first, then wring and wipe again. These microfiber car towels are perfect for detailing which is quickly removing things that make your vehicle interior look unkempt and messy. These things will include removing water posts, dust, fingerprints, etc. All you need to do is grab one of your microfiber towels, spray lightly with a detailing spray and wipe it off. Something to remember when you are using these kinds of towels is that you will get the best results if you use the towel in one direction only until the dust and grime is gone. Make sure you flip the towel frequently during the wiping process. Make sure you rinse the towel often with water and wring it out to get the dirt and contaminants off of it that you have picked up from the vehicle. When you are waxing your vehicle, use the microfiber towels in a back and forth motion and avoid using circles. Using a circular motion usually results in putting some of the dust and grime back onto the vehicle. If you fold and flip the towel over frequently as you wax, you will avoid putting any dirt back onto the vehicle. One the wax is being smeared, change towels and put the first one in the wash. You may end up using 304 per washing. You can wash most microfiber towels in the washer with liquid detergent and make sure to use cold water. Using hot water will cause the fibers to shrink and then the towel isn’t able to be used the way it was intended for. Never use fabric softener on your microfiber towels. It will ruin the density of the towel by getting into the microfibers of the towel and preventing it from absorbing water much if at all. You will have a super soft towel but it will essentially be a very soft towel that can’t be used. Never dry your microfiber towels on higher heat than Medium heat. It should be on the same settings as your delicate clothes. If you dry the towel on high heat, it will be just as damaging to the microfibers as washing them in hot water. When properly cared for and cleaned, microfiber car towels can be used as many as 100 times each before they MAY show some wear. They reduce the amount of supplies you have to purchase because they are reusable and fully washable. Remember not to wash your microfiber car towels with the regular laundry. Bleach should never be used. One thing you can do is add distilled white vinegar to the load during the rinse cycle. It will act as a natural freshener and softener that will not ruin the weave or fibers if the towels. As you can see, the possibilities are numerous and having multiple packs of microfiber car towels around means all of your cleaning jobs will be done efficiently, thoroughly and completely. Each of the different types of jobs above can use different grades of microfiber towels because some have weaves that are better suited to certain jobs than others are. Some use super fine weaves; others will do better with a waffle style weave. The main goal is to purchase microfiber towels that are of good quality that will last a long time…and that will do the job right. You may not have realized that something like a microfiber car towel could have features and factors that set them apart from other towels but they do. The information that you have gotten in this guide will help you understand that there are different types and styles, different weaves and different use factors to consider. The top rated microfiber car towels that have been reviewed here are all high quality microfiber towels that are in high demand for a large variety of jobs. They are available in many different colors that many establishments use as coding to signal a different towel for a different cleaning job. As a general rule, the lighter the color of the towel, the softer and smoother the texture of the towel will be. Many manufacturers have color coding that helps separate the towels from the tasks they do best handling. This method may work for you too. Microfiber car towels are the best choice to use when you are washing, waxing, rinsing and detailing. Once you use them for a myriad of tasks, you will never want to go back to sponges or poorly designed rags that are lying around. Make the reasonable investment in any one of these top rated packs of microfiber car towels and it’s likely you won’t have to buy towels again. Once you start shopping for your own set of microfiber car towels, you can use the information in this guide to help jog your memory on the facts involved in comparing different grades of microfiber towels and choosing the right one for the jobs you need it for. Many customers choose to get a few different types of these towels so they have the variety to handle many different jobs. This guide is dedicated to helping you save time and money. When you have the right knowledge, sorting through the different choices becomes much easier.